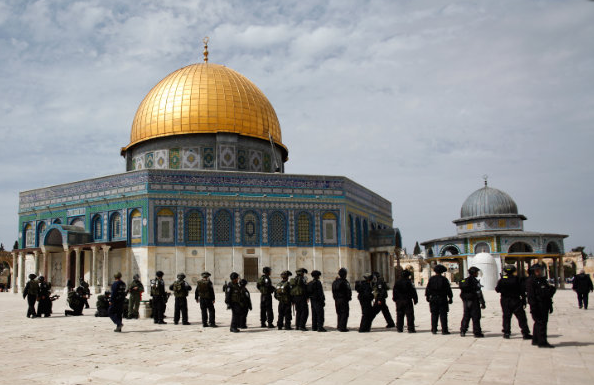 Jerusalem Police units stormed the Al-Aqsa mosque compound early Monday and prevented dozens of masked assailants from carrying out a planned attack. The assailants had amassed on Temple Mount with rocks and fireworks with the intention of confronting police and disrupting the peace. Overnight, the assailants gathered weapons and prepared Molotov cocktails inside the mosque. They also barricaded it by nailing shoe racks to the doors and creating obstacles with metal rods, wooden beams and barbed wire affixed to doors. Inside the mosque they built structures out of wood and wire mesh to be used as shields for rock throwers and fireworks shooters. But the police, operating on gathered intelligence, surprised the rioters and foiled their scheme. The police arrived early, armed with riot gear, removed the obstacles and locked the assailants inside the mosque. “The Jerusalem Police will continue to take decisive and firm action against law breakers and bring them to justice,” a police statement said Monday. Despite the potential clash, it was decided to leave the Temple Mount open to visitors. Last week, three police officers were injured by thrown stones and fireworks when clashes broke out on the Temple Mount on Wednesday. Good for the policemen. I like it when the tables are turned on the trouble makers!